Colorful, a prominent Asian graphics card vendor, is announcing a new GTX 560 Ti model today. 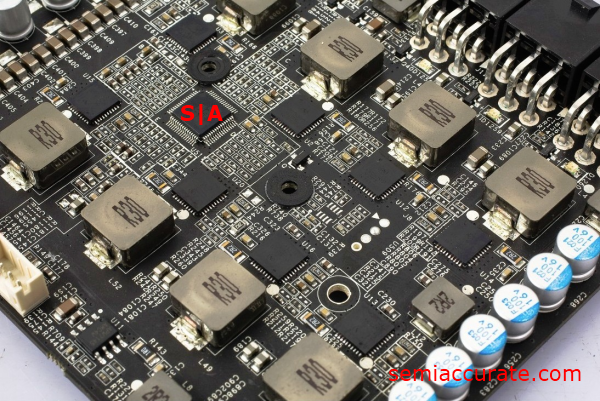 This particular card uses a custom designed PCB that deviates in a number of key ways from Nvidia’s reference design. The first thing you’ll notice is that this PCB is a fair bit longer than the standard GTX 560 Ti boards that you’ll find in the wild. In addition Colorful has heavily expanded the power circuitry on this board. 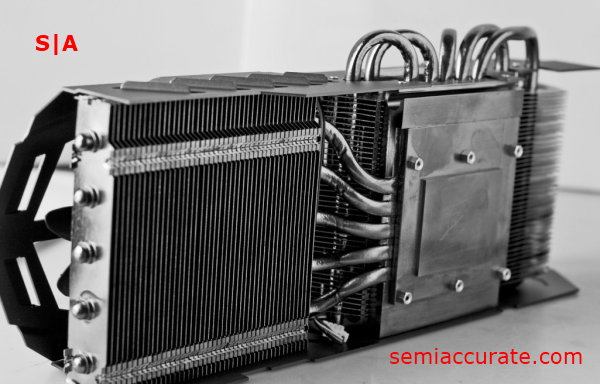 The cooler Colorful chose is really quite a beefy one; it sports ten nickel plated heat pipes that connect to a two part heat-sink that towers three slots high directly over the GPU die, and then extends over the card’s beefed up power circuitry. Now for the really fun hardware on this card. Scroll back up to the first image of Colorful’s PCB. Now if you look on the left hand side of the image near the display outputs you see we’ve boxed in an empty area on the PCB with a white expansion slot at the bottom. Our divining rods here in the orbital laboratory seem to indicate that the slot in question is none other than a Mini PCI-Express slot. 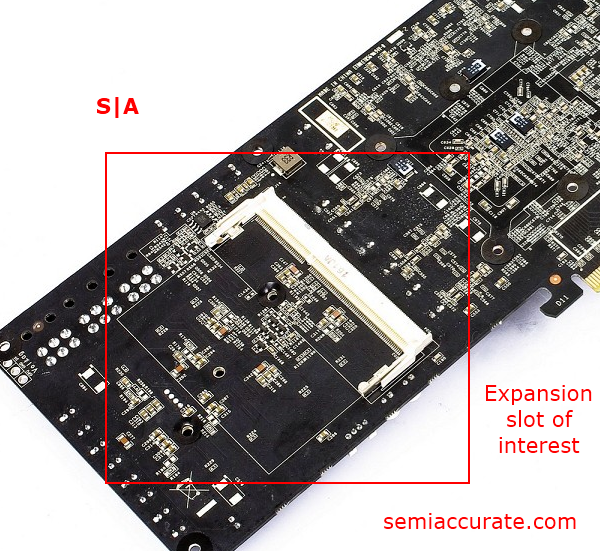 Finding one on a graphics card is rather unusual because they are normally found on laptop motherboards and have a lot in common with a PCI-E 1x slot. Now if you’ll please take a gander at the next image you’ll see yet another white expansion slot. This slot is a bit of a mystery, and our magic 8 balls won’t give us an answer, so that leaves us with only one method of investigation, our less-than-reliable vision. Luckily, we’ve narrowed the options down to two main candidates, it’s either a DDR3 SoDIMM slot or an MXM slot. 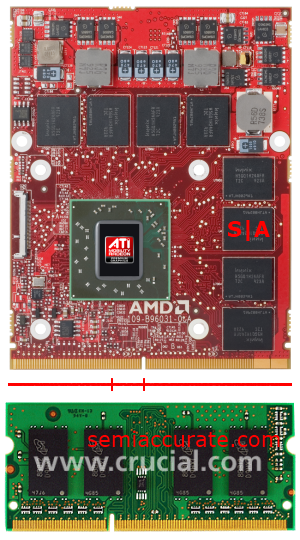 Both options are shown on the right of this column, with one of AMD’s mobile 5800 series parts showing off it’s MXM teeth, and a chip from crucial demoing the DDR3 SoDIMM standard. Maybe your vision’s not so blurry or you’re cunningly harboring knowledge about that slot; if so let us know in the comments section. The card Colorful has created here is really quite an odd beast. Based on its layout I could almost see someone hooking a wireless card into the Mini PCI-Express slot on the front and 4 GB RAM into the slot on back. Why you’d ever want to do that I can’t say, but someone must have plan for this peculiar card.